Scottish Peace Network Demonstration at UK Armed Forces Day Event. Saturday 28 June, 11am – 1pm. Smith Museum, Dumbarton Road, Stirling. The 28th June is Armed Forces Day, a national ”to show support for the Armed Forces.” This year in Stirling it conflicts with Bannockburn Day, and, celebrating the role of the forces for “the whole of the UK”, has ramifications for the independence debate. 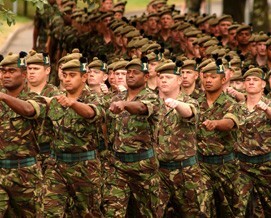 Armed Forces Day was established by the government “to show support for the Armed Forces” and this year is being held in Stirling. It is deeply insensitive and ill-timed; why it is so offensive to make the weapons of war central to a celebration, even to allow children to play with them as if they were not the things that rip human flesh apart but merely some neutral item of technology. It is shocking that the UK government and other governmental bodies, including the Stirling local authority, as well as corporate sponsors, are spending £500k on the day’s events at the same time as basic services such as education and health are being deeply cut. Whatever your voting intentions in the Scottish referendum there can be no doubt that the staging of the UK-wide Armed Forces Day – with its unionist overtones – in the heart of Scotland just 82 days before the vote is deeply cynical. In this centenary year, instead of glorifying the militarist strand of Scottish heritage that has encouraged so many young men and women to enlist in the British Armed Forces, we should be praising the voices of peace, such as the conscientious objectors imprisoned during World War I, John Maclean who was jailed for his condemnation of that war as a bloody struggle of imperialist rivals, trade unionists who stuck to the principles of international brotherhood and organised on the Clyde, and the women who worked for peace and social justice throughout World War I. Responding to this the Scottish Peace Network, of is holding a peaceful vigil and will be leafleting and calling for No More Wars. All welcome.